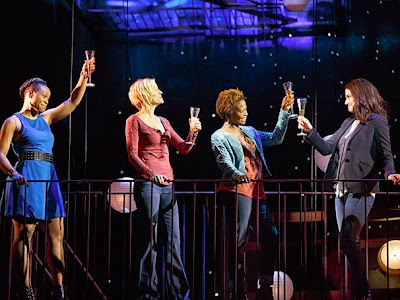 "If/Then," featuring Tamika Lawrence, Jenn Colella, LaChanze and Idina Menzel. Photo from production. WHEN Lucy Liu and Jonathan Groff announced the nominations for the “68th Annual Tony Awards” on 29 April, there were serious oversights. Some fine and/or interesting productions, as well as superb performances were overlooked. First, gripes about the ones that shoulda been named, then predictions about the winners from those that made the cut. If this reviewer takes it personally, imagine how the casts and creatives on the unacknowledged and under-acknowledged shows feel. Maybe it's just the Tony committee messing with the regular theater-lover's head. "The Realistic Joneses," Will Eno's comic tragedy and its deserving star, Toni Colette, did not get a mention. (http://www.bit.ly/1x8UT0S) Although the play left a lot of holes in its odd plot points, it was well-staged and wildly interesting. The acting from the ensemble of Tracy Letts (a past Tony winner), Michael C. Hall, Marisa Tomei (Academy award winner) and the aforementioned TC, was top-notch. The Joneses meet cute, with one couple stumbling onto the other’s property in the dead of night bearing a bottle of wine. Existential issues are then addressed. Another overlooked drama was "Lady Day at Emerson's Bar & Grill." Do note, however, that Audra McDonald, as Billie Holiday, was nominated in the Best Actress category. (http://www.bit.ly/1jRGDzG; see video above). Broadway's producers are to be congratulated for taking the chance on so many straight plays, an oft misunderstood and under-appreciated entertainment this season. The applause would be that much louder, though, if unconventional vehicles like “The Realistic Joneses” were in the Tony running. Other major snubs include “Bullets Over Broadway,” “If/Then,” “The Bridges of Madison County” and “Rocky.” The blow to all is lessened because each got nods in other categories. 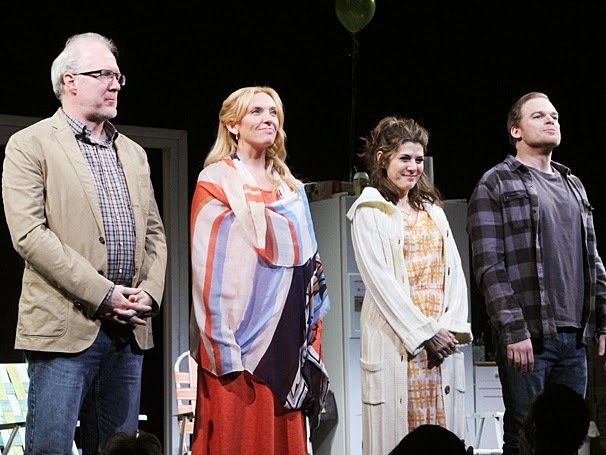 Tracy Letts, Toni Collette, Marisa Tomei and Michael C. Hall in "The Realistic Joneses." Photo from production. For instance, Woody Allen was tapped for Best Book of a Musical for “Bullets.” Also Nick Cordero is up for Best Featured Actor in a musical for his role as Cheech. “If/Then's” amazing star, Idina Menzel, is up for Best Actress in a Musical. The musical's creative team of Tom Kitt (music) and Brian Yorkey (lyrics) are up for Best Original Score. The “68th Annual Tony Awards” airs at 8 p.m. on Sunday, 8 June on CBS. Visit http://www.tonyawards.com/ to learn more about the nominations and broadcast.